Much of the world's crop outputs are grown in areas receiving little precipitation without the use of irrigation. 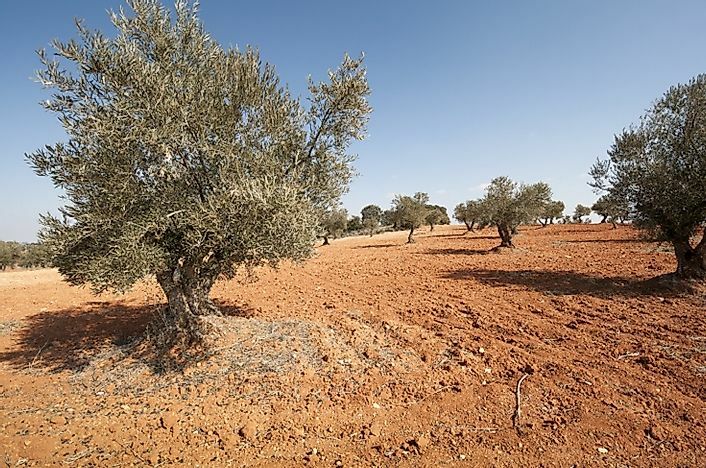 Olive trees such as these are well-suited for growing in semiarid environs. Large parts of the Earth’s surface are arid, receiving low volumes of annual rainfall and with little or no supply of water from rivers or other freshwater resources. Yet millions of people continue to inhabit such areas, often depending on specialized agricultural practices for cultivating crops to meet their dietary demands. Dryland farming refers to the practice of growing crops in the absence of irrigation facilities in arid areas (those receiving less than 50 inches of annual precipitation). The success of dryland farming depends on the efficient use of the little moisture that is trapped in the soils of crop fields for growing crops, and also the wise selection of crops that will suitably adapt to the farming conditions of dryland farming. Dryland farming is practiced in many arid areas of the world. These include the countries of the Middle East, the steppe lands of Eurasia and South America, large parts of Australia, southern Russia and the Ukraine, and parts of Mexico, as well as many areas in the United States like the Great Plains region and the dry, southwestern United States. Crops grown through dryland agricultural systems must be highly drought tolerant. However, germinating seeds or rooted cuttings of these plants still require a considerable amount of water. Hence, normal water conditions must be available during the initial stages of plant growth. A lot of experimentation goes into determination of the type of crops to be grown by dryland farming at a particular location. Besides water availability, temperature conditions, the nature of the soil, the topography of the land, and other factors act in unison to determine the success or failure of crop growth on a piece of land. Often it takes years of experimentation to establish a successful crop on dryland farms. Corn, sorghum, and millets are some of the cereal crops best suited to dryland farming. Legumes like common beans, cowpeas, and pigeon peas, leafy vegetables like cassava greens, comfrey, and leucaena, fruit vegetables like watermelons, okra, dates, papaya, cashew, olives, and tamarinds, and oil plants like owala and sunflower seed are usually suitable for growth in arid climates. Among the non-food commercial crops that can be grown in arid climates are fiber-producing plants like Sea Island Cotton and sisal, timber plants like umbrella thorn, and feed legumes and grasses like mesquite, Mother of Cacao, and Bermuda grass. Some crops are, however, completely impossible to grow by dryland agriculture, such as the food crops of rice (requiring 3,000 to 5,000 liters of water per kilogram of crop produced) and sugar-cane (1,500 to 3,000 liters of water per kilogram), and certain varieties of commercially cropped cotton (7,000-29,000 liters of water per kilogram). Dryland farming demands a great deal of effort to ensure that the soil is not deprived of moisture. Formation of soil crust at the surface is prevented by tillage to allow rainwater to seep in and reach the plant roots. Water runoff from crop fields is checked by leveling the fields and establishing bunds or contour strips. Soil water evaporation is inhibited by mulching and the planting of shelter belts of trees and shrubs. Dryland farming also involves the planting of crops in a more dispersed manner, and in less numbers overall, than what is seen in "wet" farming methods. Weeds are completely destroyed so that these insignificant plants do not compete with the crop plants for water. Strip cropping is also commonly practiced in dryland agriculture. During the fallow periods in dryland agriculture, no crops are grown in the fields to allow the soil to absorb and retain moisture and recharge their nutritional capacities. Dryland farming is highly important to ensure the economic stability of a region or nation with arid lands. In the absence of this farming practice, vast tracts of lands in the world would be left barren and unproductive. Even though dryland farming takes a lot of financial investment and hard work to be established, and crop yields are generally comparatively lower, without this form of agriculture the populations residing in the arid areas of the world would have to be completely dependent on external sources of food to meet their dietary needs. This would adversely impact a nation’s economy as self-sufficiency, in terms of production of food grains to feed the country’s population, would be lost. Today, as the effects of climate change grips the world and the problem of desertification intensifies, more farmers across the world are planning to utilize the methods of dryland farming to cultivate their own crop fields. In 2013, California experienced its driest recorded year ever, and lost nearly $2 billion USD of agricultural economic output in 2014 due to the drought. In the near future, many arable lands of today might have to completely depend upon dryland farming methods to sustain their agricultural outputs. What Is Slash And Burn Agriculture?